Morgellons also called fiber disease is a condition whose sufferers believe to have been infested with disease-causing agents described as things like insects, parasites, hairs or fibers, while in reality no such things are present. Morgellons is a condition that has been widely fought over in the medical community. Dermatologists, doctors and psychiatrists all call this "delusional parasitosis" and a lot of the symptoms they experience are more psychological. Every case of morgellons has been self-diagnosed by the patients not doctors. Sometimes the "mogellons" that they patient claims to have are actually a real skin conditions like allergic contact dermitatis, idiopathic urticaria or infestation with the parasite scabies. Sores that leave very red scars. Since this is seen as a psychological condition most doctors would prescribe anti psychotic drugs. However people who firmly believe they have the illness have self treated with methods such as rubbing bleach on skin, using deworming medicines meant for animals or industrial insecticides. Phrenology was back in the day psychology. In the 1700's phrenology was considered the " only science of the mind" brought about by Franz Joseph Gall. In keeping with the theme that it was back in the day psychology, Ancients Greeks used phrenology to separate parts of the brain and give them specific functions. Not much different from what we do today..so is this really pseudoscience or was it just the new undeveloped beginnings of a science we recognize today as being a true science? DMT, otherwise known as Dimethyltryptamine is known as the spirit molecule. The claim is that this drug brings you out of body and to the spirit world and often leads to religious experiences. The claim is that the drug will take a person out of body into outer-space and then to a weird religious experience. Other people claim that it may take them to alternate dimensions. What we really know about this illegal drug is it is a hallucinogen that gives some people stronger effects then others. Although many people have had this out of body experience, it is hard to say that this drug really gives this after life experience as we do not truly know what is to come in the afterlife. The most common relation people find in relation to this drug is the near-death experience people have where they say they see something otherworldly. The human body arguably creates this drug in the pineal gland prior to death and many people want to experience this experience. The question comes down to, does this drug really give this out of body experience of being pulled into space and is this a way to see and meet other worldly people. Bigfoot, otherwise known as Sasquatch is a mythical ape/human creature that is rumored to live in the Northwestern United States.Although many believe the creature is from the northwest, reported sightings have happened all across the United States. The popularity of Big Foot grew in the late 1950’s after many magazines published articles claiming to have discovered large mysterious footprints in California. Although there is no hard scientific proof that this creature exists, there is still a percentage of the US population that truly believes that this ape like creature is roaming the forest. Most of what we know about this supposed creature is based on eyewitness accounts and unreliable photographic evidence. The issue with eyewitness reports is that they are quite often extremely inaccurate and more often than not, a hoax. The most famous piece of Bigfoot evidence is a 1967 film by Roger Patterson and Rob Gremlin. The film shows a dark haired, man sized ape like creature walking through a forest in California. Most criticize the film, claiming it is a hoax, but it is the clearest look we have ever had at a supposed Bigfoot. Many Bigfoot enthusiast have tried to use scientific evidence to prove the creatures existence, but normally they fail to do so. Samples of “Bigfoot Hair” normally end of being from an Elk or Bear. Also, it is impossible for one member of one species to exist.If Bigfoot was real, there would need to be thousands of them in order to maintain the species. While Bigfoot's existence seems unlikely, there are still many people who definitely believe that the creature is out there. Until the day Bigfoot decides to show himself to the world, it remains to just be another creature to be on the look out for in the woods. Astral Projection: Is it Possible? Astral projection is an out of body experience that assumes the existence of an astral body separate from the physical body and is capable of traveling outside of it. This idea is based upon religious beliefs of the afterlife in which the consciousness is described as the out of body experience. The spiritual traveller leaves the physical body and travels into higher realms. Furthermore, astral projection is frequently associated with dreams and meditation. Patients have reported these feelings through hallucinations, however there is no scientific evidence that supports any manifestation of the consciousness being able to separate from neural activity. There is also no scientific evidence to support the idea that one can consciously leave the body and make observations. Around the globe there are locations that can be mapped out across the earth to expose the location of twelve specific areas where unexplained phenomena occur. These locations were originally brought to people's attention by Dr. Ivan Sanderson who authored the article "The Tweleve Devil's Graveyards around the World. The most commonly known being the Bermuda Triangle. Some scientists believe it is the occurrence of a particular mineral known as aluminum isotope 26. This was discovered by a scientist who studies the vortices after his son was killed in one by their family dog that just happened to go crazy. He took sediment samples from all of the locations where these "devil's graveyards" are said to exist, all contained this blueish layer in the dirt which was the aluminum isotope 26 . It is believed that the aluminum 26 interferes with the earths magnetic Fields doing everything from inhibiting them to forcing the magnetism of earths rotating core to build up underneath the antimagnetic layer. When this happens it is released in bursts causing compasses to spin, machines to malfunction and animals to become disoriented and lose their sanity and sense of direction. How did the aluminum isotope 26 end up in all of these places evenly mapped across the globe? No one knows but scientists have shown that in order for this particular isotope to occur where it does a massive amount of heat energy must come down from the sky and convert the minerals. Could extraterrestrials be using these magnetic vortices as part of an elaborate navigation system as many believe? The map below shows the ten vortices spread across our earth. Excluding the north and South Pole which are the final two vortices. Also History Channel had an hour long special on this topic which was interesting and informative if you would like to further your knowledge. There is a product out in the market that has consumers to believe it is this magical fountain of youth type of machine. The presentation of this machine is that it is the all time answer to healthful benefits such as weight loss, and fights cancer off. The purpose of this product is to remove acid from water sources and become more alkaline based. The marketing technique that I personally have observed is word of mouth, and small private seminars, such as presentations in someone’s living room. The person promoting this machine presents information such as facts of alkaline water vs. acidic water. The presenter also demonstrates an experiment of different waters and their acidic concentration, and then presents his product to show how it has no acid in it. The presenter uses charts similar to the one below and explains why consumer should be in the purple for an alkaline water concentration. Another piece of information this person uses to show how important it is to have this machine he presents a woman who is a “living experiment” who goes on talking about how it changed her life and she lost 60 pounds from drinking the water along with diet and exercise. The interpretation the presenter tries to give is the magical water was what did it. When in reality the reason why she lost all the weigh is because she changed her lifestyle and ate differently and exercised. Throughout this presentation the person throws out all kinds of facts to the audience such as how the Japanese have been using these machines in their hospitals, and then says it was like a holy water a long time ago, then that is was water found in some magical spring in France. 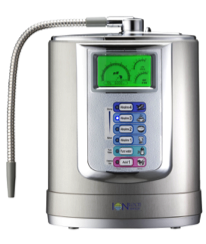 The kangen water machine replicates this alkaline-based water. This presenter is persuading all these facts to make the audience believe they have to have this machine to be healthy and lose weight. This relates to pursedosience because the machine in reality Is a water purifier just like Britta, or Zero Water. The only difference is this presenter does this whole presentation to make consumers think this machine is so great and magical that will answer all their problems, therefore they would be willing to pay anything to own one. They are priced anywhere to 100$-$4,000. This product is demonstrated to be something so wonderful when in reality it is a water purifier. Yes you should know what’s in the water you drink but you shouldn’t rely on a magic water-making machine to solve the world problems.